We ensure you the best of full day car hire service in Tiruchirapalli. Under this category, we offer full day rental service to suit a number of local tour purposes such as sightseeing, attending meetings, shopping, seminars, visiting hospitals, and a lot more. Tiruchirapalli is home to many ancient and historical temples. And it isn’t practically possible to visit all of them within a specific period of time. But don’t worry if you don’t have a lot of time in hand. We have a unique half day car rental package for you. 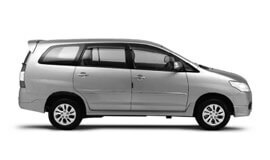 Some of the most popular services under this category include Airport Transfer in Tiruchirapalli, Car rental service for Marriage, party and event, Corporate Cab Rental in Tiruchirapalli, Railway Transfer, visiting hospitals and a lot more. We have designed an exclusive outstation travel package to help our clients enjoy trips within and outside the city. We offer special arrangements for excursions, weekend getaways, and family leisure trip outside the city limits. Looking for excellent quality to and fro service? This is what we specialise in. Our roundtrip service is available for various destinations from Tiruchirapalli. Our one way drop hire service will help you enjoy premium quality taxi service to your desired destinations starting from Tiruchirapalli. For visiting multiple cities at a specified period of time, reach us online or visit our office in Tamil Nadu. We will be happy to serve you. Our high quality service are widely appreciated by our clients. With us, you can rest assured about having a unique travel experience throughout. For a package that caters to your needs and budget, we will customize an exclusive car hire service for you. Our team will listen to your precise travel needs and budget to help you get the best. We guarantee the best car rental services in Tiruchirapalli at highly affordable prices. Tiruchirapalli experiences a sub-tropical climate and as a result no major fluctuations in temperature are seen between summer and winter. The hottest months of the city are May and June. The nights are cooler with the help of sea breeze setting in the evening. Winter persists from November and lasts till the month of January. The climate during this period is cool. Monsoon hits Tiruchirapalli between October and December owing to northeast branch of monsoon. As per official census report for the year 2011, Tiruchirapalli district has a population of 847,387 residents. Tiruchirappalli was widely revered for its tanneries, cigar-manufacturing units and oil presses under the British rule. Presently, the city is known for flower bazaar in Srirangam, mango market at Mambazha Salai, rice mills in Manachanallur, engineering equipment manufacturing and fabrication, Railway Workshop, and many more. Major share of revenue also comes from the local gem industry. Also referred to as Trichy, Tiruchirappalli is a beautiful ancient city located in Tamil Nadu state and once served as the capital of Chola and Naicka kings in. The city is celebrated for its rich historical background. This is also the reason Trichy is visited by a huge number of tourists from all over India. Some of the best tourist attractions in the city include the Rockfort Temple, Uchchi pillayar temple, Thayumaanavar temple, Maanikka vinayagar temple, Sri Ranganathaswamy temple, Jambukeshwara Temple, Perumal Malai, Samayapuram Amman Temple, Vekkaliamman Temple, Vayalur Murugan Temple, Sendamarai kannan temple, Viralimalai Murugan Temple, Gunaseelam, Mukkombu, Kallanai dam, Puliyancholai, Brihadishwara Temple, Ragavendra Temple, and many more.